After a partial roof collapse, Acme Feed &amp; Seed's first floors may reopen but the rooftop bar won't be opening any times soon. After a partial rooftop deck collapse, Acme Feed & Seed's first, second and third floors will reopen but the rooftop bar won't be opening any times soon. On Sunday, a portion of the roof caved in, setting off the sprinkler system and creating a dangerous situation for everyone inside. The Metro Nashville Codes inspector met with a structural engineer hired by Acme to review and discuss the damage. The fire department spokesperson said it's unclear if the partial collapse was caused by too many people on the roof. Only 224 people are allowed on the roof at one time. The entire building is currently closed, but the first, second and third floors will be reopened on Tuesday. Acme Feed and Seed hasn't had any code violations in the past. "On Saturday afternoon, Acme Feed & Seed experienced a partial collapse of its rooftop deck, when a section of the deck separated from its support. No one was hurt in the incident and the building was evacuated immediately. A structural engineer has inspected the roof and has concluded there is no damage to the roof itself. Additionally, both the contractor involved in the design and construction (Crain and Tuck Hinton) have inspected the damage and are assessing what caused the failure. Initial tweets by the fire inspector mis-characterized the situation as a roof collapse, which it was not. Both the Nashville Fire Department as well as the Department of Codes and Building Safety determined that no other floors were affected by the incident and have cleared Acme to reopen floors 1-3 tomorrow, Tuesday, October 16. 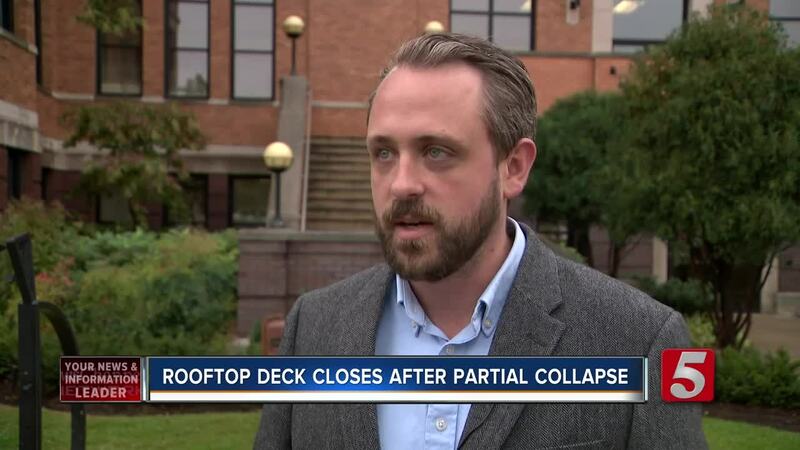 We will start repairs on the deck as soon as possible, and anticipate being able to reopen the roof within a week or two, depending on the extent of the damage."